Philadelphia Eagles starting quarterback Nick Foles throws a touchdown pass against the Oakland Raiders in the first quarter at O.co Coliseum in Oakland, Calif., Nov. 3. Lurie then went on to support current quarterback Nick Foles by saying that he “has a lot going for him” and that he would have an opportunity to showcase his ability Nov. 3 against the Oakland Raiders. 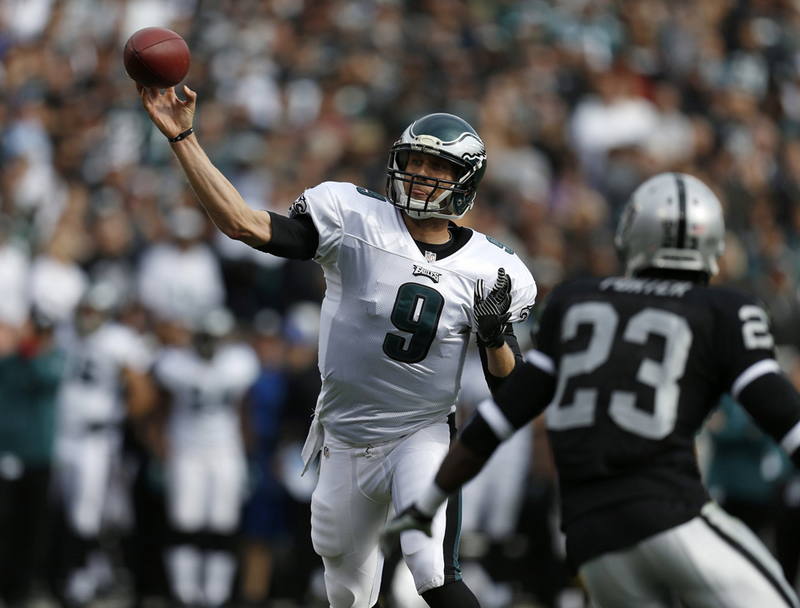 After the Eagles thrashed the Raiders 49-20, it is safe to say that Foles grabbed his opportunity by the horns and has no intention of letting go. The second-year quarterback threw for 406 yards and seven — yes, SEVEN — touchdowns, tying the NFL record for most touchdown passes in a single game. This legendary performance put Foles in the company of legendary quarterbacks such as George Blanda, Y.A. Tittle and Peyton Manning. But most importantly, he led Philadelphia to a much-needed victory, which rather remarkably keeps them only one game out of first place in the NFC East. Perhaps no one on the team needed the win more, though, than head coach Chip Kelly. After a nightmarish two-game losing streak, which featured 15 punts off the right foot of Eagles punter Donnie Jones, even the most loyal Philadelphia fans were questioning whether Kelly’s swanky read-option offense was tangible, let alone effective, at the professional level. Against Oakland, the offense sure looked effective, reminiscent of the one Kelly ran at the University of Oregon, where he lit up scoreboards on a weekly basis. Travis Kadish, a Drexel sport management major, said that he thought “the Eagles offense operated with video game-like efficiency.” Just as impressive as the offense’s score count was the fact that the team did not commit one turnover, which marked a major improvement over the past two weeks, during which they had committed six total giveaways. One consistent criticism of Kelly going into the game was that he underutilized second-year running back Bryce Brown, who after an impressive rookie year only had 38 carries going into Sunday’s game. Brown led the Eagles in rushing yards against the Raiders with 55 yards on seven carries — an impressive average of 7.7 yards per carry. Going forward, a productive Brown not only allows Philadelphia to give running back LeSean McCoy a rest but also gives the offense a source of explosive power, something that had clearly been absent in the Eagles, a team built on speed and quickness. Lost in the headlines has been the play of the Billy Davis-led Eagles defense, which has played consistently well in recent weeks, allowing an average of only 12.5 points over the past four weeks. The Philadelphia pass rush against the Raiders generated consistent pressure, and Mychal Kendricks, Trent Cole and Vinny Curry each picked up a sack. Meanwhile, Bradley Fletcher and Connor Barwin each plucked an interception off Raiders quarterback Terrelle Pryor. After a rough start to the season, the defense finally seems to be meshing. Consistency is the name of the game, though, and the Eagles — especially the offense — need to begin to show it. Philadelphia is fortunate to still be in a position to win the division and make the playoffs with a 4-5 record through nine games. Despite the glitz and glamour of their victory on Sunday, the Dallas Cowboys and Washington Redskins both picked up wins as well, leaving the Eagles in the same position in the division as last week. Kadish suggested that the “Eagles should not celebrate their victory too much but instead focus their attention on their upcoming trip to Lambeau Field.” That seems like good advice because Philadelphia’s next game Nov. 10 against the 6-2 Green Bay Packers surely will be a challenge. The Packers are widely considered one of the best teams not only in the NFC but also in the entire NFL. The Eagles’ performance in Green Bay should give fans an indication of just how good or bad this team really is because, the truth is, no one seems to know.